In which I'm exposed as a "true bigot"
"Spoken like a true bigot." That's the reply I got to a comment I made on Facebook to the picture below. What was this truly bigoted comment? "Wearing a haircut like that is about the same as putting on a cop/military uniform. It's not "fair" that people will see the wearer a certain way, but it is certainly understandable. And, a haircut, just like behavior or a uniform, isn't something you are born with and can't change (like "race"). I'm very sorry, but if I see a person with that haircut, I am going to be cautious and probably avoid them, for fear they are a government-employed aggressor, out of uniform. The risk of assuming the person isn't one is just too great to be worth taking." First of all, I understand the picture to be tongue-in-cheek. I don't even consider that the quoted odds might be accurate. It's a JOKE. Ancient humans didn't survive to reproduce if they got eaten by a bear. It was dangerous to not see a bear that was there. It wasn't dangerous to believe you saw a bear, when it was only a rock. Those who mistook bears for rocks didn't survive long, while those who mistook rocks for bears did, even if they were wrong. Even if they got laughed at. Cops are modern humans' bears. Or pigs. Or ManBearPigs, perhaps. Either way, it is more dangerous to not see a cop that is there than to "see" a cop that isn't-- to mistake a person who merely looks sort of like he might be a cop for a cop. Again, it's not "fair", but it's reality. 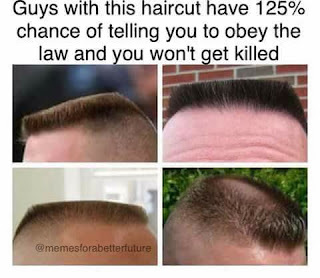 I understand that some people who are not cops, and may not even like cops, like to wear that haircut. I also understand why they would be upset at the assumptions other may make about them when they notice the haircut. Really. I get it. I have also experienced bigotry over my hair. It's not pleasant, but it just is what it is. If I want to change that reality, I can change my hair in mere minutes. So can someone wearing their hair in a way that makes them look like a cop. It comes down to what is more important to you. Every choice you make WILL have consequences. If you choose to wear your hair in a style that is associated with cops/military, it seems whiny to be upset when people treat you as though you may be a cop.